The long, excruciating wait to get USB-C support on your Surface Pro or Surface Laptop is about to end at long last – well, at least for your office. Microsoft has told The Verge that it will begin selling its long-awaited Surface USB-C dongle on June 29 for $79 (about £59, AU$109) in the US. However, according to Microsoft’s statement, the device will first be made available for business users through commercial channels. The company has not said when it will release the product through normal retail channels. While not yet officially shown, we know that this dongle will connect to the Surface Pro and Surface Laptop – the Surface Book 2 already has native USB-C – through their Surface Connect ports. This is thanks to a leak earlier this year from a reputable source. This leak suggested that the device itself would be rather large, looking to be nearly the size of the existing Surface product power bricks. Using the Surface Connector port that Microsoft posits is nearly as fast and versatile as USB-C, the dongle will allow users to charge their Surface device as well as connect to external hard drives and displays. 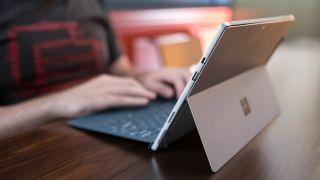 The Verge suspects that, like the Surface Pro LTE, the Surface USB-C dongle will be available to all via the Microsoft Store on June 29 but otherwise be limited in sales to commercial customers rather than retail. So, for the three of you that are holding onto that hope to join the #donglelife, our thoughts are with you.